10 years ago I bought cheap world band receiver (Silvercrest from LIDL) but it has no direct fx entry, nor lateral bands, or external antenna input, batteries lasted nothing… and SWLing experience was very poor and didn’t woke up my SWL interest. SWL is just listening to the Short Wave bands (3-25Mhz). It’s amazing how ionosphere propagation helps radio signals travel across the world directly to your cheap radio receiver. Cheap.. or not. There are people who spends more than 200$/€ on shortwave receivers. The thing for a good experience is that the receiver has external antenna input, good filters and lateral bands (USB/LSB) in addition to habitual AM/FM. Recently I just discovered the XHData D808, a chinese brand new world receiver that has all the features that expensive receivers has, but less than half the price. It has lateral bands, FM RDS (w/OIRT band), AIR band, Squelch, li-ion battery that lasts forever… 100% recommended. 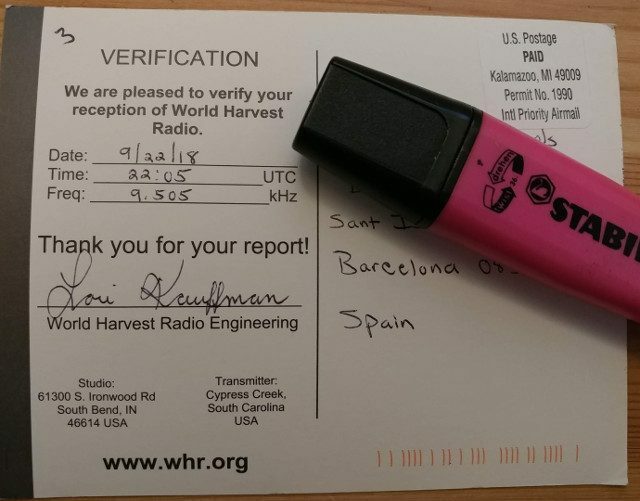 Then if you write to the station and tells them your reception report, usually they send you a QSL Card. 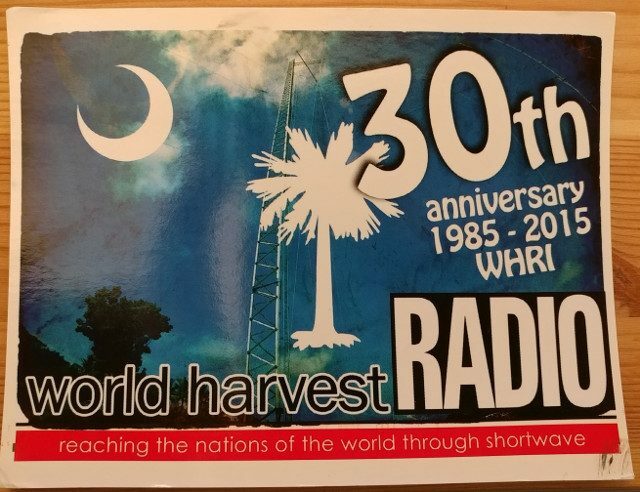 And I have received my first one from World Harvest Radio received on 9505Khz. Its amazing to know that I heard a station broadcasting 7220Km away from my location without any kind of infrastructure. It was late 80s when my father brought our first PC to our home. It was an 80286 at 8Mhz, 1024Kb of RAM and a 20Mb ST-225 Seagate Hard Disk. That hard disk occupied a 5.25″ bay and was connected via MFM interface, the IDE predecessor which used similar encoding as Floppy Disks. That computer was accompanied by a Zenith EGA monitor (a noisy one thanks to its internal fan) and it was my first approaching to a computer! I was so young (about ten) so I only used that computer for playing games. At that time, several games fitted into one floppy disk! That first games were Digger, Kong (Donkey), SpaceIN(vaders), GP (Grand Prix), Zaxxon, and more that I’ll explain in future posts. Past several years, I upgraded to a 80286/16Mhz with 4Mb RAM, and at mid 90s I had an 80386/40Mhz with a 130MB Hard disk (that was the same PC, only updating motherboard and components). I still conserve several of that Hardware: 80286 motherboard, ST-225 20Mb Hard Disk, 8bit-ISA MFM HD Controller, a CGA/EGA/VGA Card and I save it as a treasure! In future posts I’ll post some photos of that hardware. This is how it looked like playing on that times: 1998 PC Game Accolade’s Grand Prix. One of the common problems in Linux installations is to lose or damage the the boot loader (Grub), specially if on the same machine coexists other OS from Microsoft family. On the other side, while you are testing Linux you can loose your Windows Boot. Launch Boot-Repair, then click the “Recommended repair” button. When repair is finished, note the URL (paste.ubuntu.com/XXXXX) that appears on a paper, then reboot and check if you recovered access to your OSs. If the repair did not succeed, indicate the URL to boot.repair@gmail.com in order to get help. I don’t know if it’s a normal situation or it is one of that things that only happens to me: All my photos had lost their original timestamp. So all files have the same date (the date when files were copied from the old hard disk) and it’s a mess when you have gigs of photos from travels, family, events, animals, etc. without its original shoot date. So I adapted this little script that reads EXIF data from JPGs recursively into folders and sets timestamp on the files accordingly. Easy! All you need is the exiv2 tool (quickly available on your distro repos) and run this little script: (Remember to chmod it to a+x or 755). echo "This script need the base directory as a parameter!" echo "All JPG files from /base_dir will be timestamped from their EXIF date"
Friday 31st July is 2015’s Systems Administrator Appreciation Day, better known as Sysadmin Day! Today I’ve learnt that a Linux partition (which is mounted) can be grown “a la brava” (means “the hard way” in Catalan) directly modifying it through Fdisk and then resizing with resize2fs. That’s it…. With my own conservative way I’d boot the machine into Gparted (A very useful small distro that boots into Gparted directly), resize the partition (unmounted), and then reboot again. The only condition is that the partition which has to be grown is the last one. If not… things get more complicated (or not, if the last partition is a swap one, which can be erased and recreated without problems). Other condition is that particion can only be grown (not shrink). First grow the disk physically (can be a VM disk, a new bigger disk just cloned, or simply a partition that does’nt fill the entire disk). With Fdisk, remove the partition. Without exiting Fdisk, create a new partition. Carefully note that the first sector match the previous first sector. The last sector can be the end of the disk i.e. Verify/toggle Boot flag, must be activated. Save and exit. Cross your fingers and reboot. Once rebooted, grow the filesystem with resize2fs. ## (Note that HDD is 26.8 Gb. It has been grown previously at XEN dom0 level). # Remove the last partition. DON'T WRITE CHANGES YET! # In my case 999424. If in your case doesn't match for whatever reason, ABORT HERE! Performing an on-line resize of /dev/xvda2 to 6428672 (4k) blocks. The filesystem on /dev/xvda2 is now 6428672 blocks long.